We at UD Truck Wreckers Melbourne can give you the fastest, convenient, most easy and reliable service of selling UD truck on the same day. We have been in Ud truck buying dealership and wrecking industry for more than a decade now. And we provide great customer service which is why we have numbers of loyal customers that we take pride in. If you are looking for UD truck wreckers in the Melbourne, Geelong or Ballarat city area, then you can be sure that you have someone to rely on to. UD trucks have been around the Australian market since 1973. However, all truck owners know that every vehicle has a life cycle. It is imperative that a vehicle once it is wrecked or totally damaged needs to be put somewhere where it can be dismantled as part of our responsibility with the auto recycling process and for the safety of our roads. UD trucks are no exception and this can drive owners to sell their junk, wrecked, used or old UD trucks for cash. And we provide a platform where you can get all while selling and removing your truck. In fact, we are dismantlers of UD trucks in Melbourne. We wreck and dismantle UD truck for different purposes. Which includes selling parts, engine, transmission, scrap metal. We are licensed and regular truck dismantlers in Melbourne. So, you must be with peace of mind that you are dealing with authorized UD truck dismantler. So, if your truck is too much old, rubbish, scrap, junk or unwanted. Then don’t worry your cash is ready and you are one call away from removing your UD truck in Melbourne. Get Cash for Trucks in Melbourne instantly, No major paperwork involved. Selling your UD trucks with us is very simple and free. We have made it so fast and easy because we are a firm believer that customers should always come first. This is why the processing of selling your old, damaged, or unwanted UD truck is as easy as 1 – 2 – 3! Call our friendly evaluation team or fill out our online form – provide us with the details of your UD truck such as the following: age, year, model, and mechanical issues. We will give you a non-obligatory quote for the value of your UD truck – in fact, we can pay cash for as much as $10,999 for your old UD truck. Once in agreement, we will come down to your location and give you the cash instantly and remove old, unused, damaged or wrecked UD truck from your place to our collection centre. We pay cash and wreck UD trucks for its parts – engines and scrap metals. This is why you can sell your old, used, unwanted or damaged UD truck to us and you can get cash for it. While some old UD truck buyers promise that they will give top cash for your old UD truck, they sometimes offer free pick up or removal service conditionally. 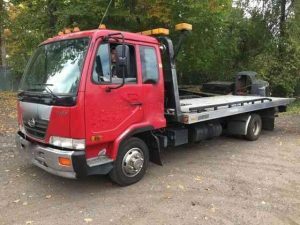 But here at UD Truck Wreckers Melbourne, we will provide you with the convenience of getting rid of your old UD truck by selling it to us and we will pay cash for your old UD truck no matter what the condition is – old, used, damaged, unwanted, wrecked or scrap. Not only that we will process the transfer of all paperwork to removing your truck from your location anywhere in the Melbourne area and its suburbs. There is no reason why you should spend too much money on repair or spare parts expenses. There is also no reason why you should waste away precious space of your garage or driveway when you can use it for other purposes – when in fact, you can get cash of up to $10,999 when you sell your UD truck to us. So call us now and let UD Truck Wreckers Melbourne provide you with the ultimate solution. Free UD truck removal service includes free pick up, removal, towing, documentation of UD from your location to our collection centre. Ud Truck Wreckers provide top cash for any make and model. No matter what the condition of your damages or scrap truck, our inspection team will quote you the top price in the market.